Here’s what’s happening in the world of television for Wednesday, September 26. All times are Eastern. It’s Always Sunny In Philadelphia (FX, 10 p.m.): In “Time’s Up For The Gang,” written by Megan Ganz (Community, Last Man On Earth) and directed by Kat Coiro (The Mick), Paddy’s winds up “on a list of bars that are sexually hostile to women,” and as a result, the gang has to attend a sexual harassment seminar. 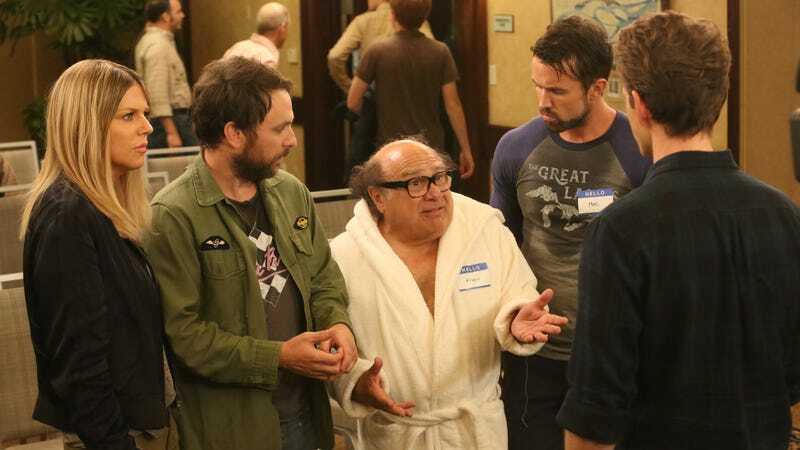 We mention the writer and director because, as with last week’s solid “The Gang Beats Boggs: Ladies Reboot,” they’re both women, and given the subject matter, we figure that might be relevant. Coiro also directed the “Ladies Reboot,” so it’s safe to assume that this will, like its predecessor, “[cruise] along with the confidence of the episode’s pair of female airline pilots.” Dennis Perkins will be on hand as the Paddy’s staff navigates the turbulent waters of not being total pieces of human garbage. Maybe it’ll go well? Honestly, it works. Should you need more convincing, watch for Erik Adams’ interview with creators Liz Meriwether and J.J. Philbin. Who will Modern Family murder?